Editor’s note – catastrophe!! I had all these great pictures of the cake, and the kids in their costumes (see below), but then my camera freaked out and somehow has eaten the pictures. It also won’t take any new pictures. Something about the memory card maybe? Either way, not awesome. After having a brief mini-meltdown, I made a double batch of consolation pumpkin muffins (recipe needs work, stay tuned) and decided to post this anyway. The cake was delicious and the recipe was already typed out, so up it goes. GOONIES NEVER SAY DIE! Apologies for the photoless post. Anyone know anything about digital camera repair? Now, I love making layer cakes, but you don’t really come across that many reasons to make them in everyday life. So I had to take advantage of the office Halloween potluck. We’re pretty serious about our potlucks. Three big tables of food, decorations, little kids in costumes trick-or-treating around the office, the whole nine yards. The perfect excuse for a cake! Put the oven rack in the center and preheat to 350. Butter 2 9-inch cake pans, line the bottoms with parchment, butter the parchment, and flour the pans. (Save the parchment scraps! They will come in handy for frosting.) Sift the flour, baking powder and soda, and salt into a medium bowl. In a small bowl, mix the spices together. Reserve one teaspoon for the frosting, then add to the rest of the dry ingredients. With an electric mixer or in a standing mixer with paddle attachment, mix sugars and oil in a large bowl – it will be grainy. Add the eggs one at a time, mixing in well after each one. Add pumpkin, vanilla, and orange zest, and mix well. Add flour and mix until just incorporated. Using either a standing mixer with paddle attachment or an electric hand mixer, beat butter, sugar, and reserved spice mix until light and fluffy, 1-2 minutes. Add cream cheese, one piece at a time, beating well after each addition. Add vanilla and orange zest, and beat until no lumps remain, about 30 seconds. Place one cake right-side-up on your serving plate. Tuck parchment scraps leftover from baking under the edges of the cake, to catch stray frosting. Plop a big dollop of frosting in the middle, and use an offset spatula or a table knife to spread the frosting evenly toward the edges, stopping just a little short of the edge. Put as much or as little as you want in there, but remember you still need to frost the outside! Keep a glass of hot water nearby, and if your knife is sticking to the frosting, give it a quick dunk into the water every now and then. Place the second cake top-down on top of the frosting, making sure it’s centered and even. Frost the top, again from the center out. Now the sides. I like to go around, section by section, just to slap enough on there to cover – don’t worry about neatness yet. Just get enough on there so the dark cake doesn’t show through. When the cake is evenly and fully covered, take the spatula or the flat side of the knife and smooth out the top and sides of the cake. I (actually Sasha) decorated mine with halloween candy we had sitting around, but candied orange peel or candied pecans would look really nice. When you’re all done, gently pull out the parchment scraps from under the cake and your plate should be nice and clean! Now, imagine that there’s a picture of a moist, rich, fluffy, autumny cake right here. Sigh. Ever since the grocery store became overrun with squashes and gourds in the last few weeks, I’ve been wanting to carve pumpkins, for probably the first time since I was a kid. As it turns out, the art has substantially evolved since then . . . I stumbled upon zombiepumpkins.com, which has an AMAZING collection of patterns and helpful tips. 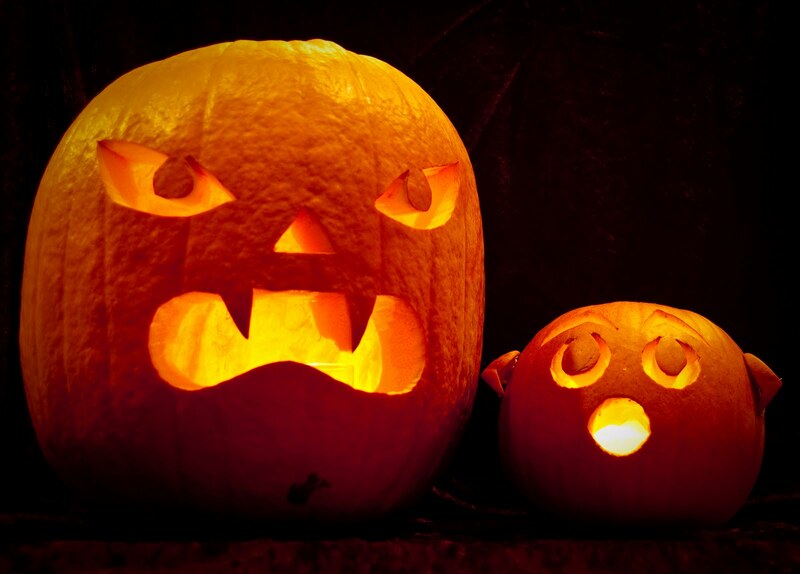 You just print out the pattern, trace it onto the pumpkin by poking little holes along the lines, and then cut along your lines. I used a cheap serrated steak knife for most of the carving, but for the really small stuff I used a long screw. This is when it pays to be a pack rat, because you always have random useful stuff like that lying around! I’ve learned an important lesson about self restraint, dear readers, that I feel I must share with you. Self restraint is entirely overrated and should be avoided at all costs. Yes, I know, it’s a controversial point of view, but hear me out. In the planning of Thanksgiving dinner, by the time you get to the desserts you’ve got so much on the menu before it that one might be inclined to go easy or, worse yet . . . light . . . on the desserts. This year’s menu confirmed what the hedonist in me has always suspected/hoped to be true – ’tis far better to never hold back. Live your dreams! Does it seem preposterous, maybe even sinful, to round out a dessert course following twelve or thirteen other dishes with a cheesecake? Of course it does!! That’s exactly why you do it. There are only a few times of year when this sort of conduct is at all acceptable, so it would be almost criminal not to make the most of them while we can, right?? Right. Adjust rack to lower-middle position and heat oven to 325 degrees. Spray bottom and sides of a 9-inch springform pan evenly with nonstick cooking spray. Pulse crackers, sugar and spices in food processor until evenly and finely ground. Transfer crumbs to medium bowl, drizzle melted butter over, and mix with rubber spatula until evenly moistened. Turn crumbs into prepared springform and spread into even layer. Using a flat-bottomed ramekin or glass, press crumbs evenly into pan bottom, then use a soup spoon to press and smooth crumbs into edges of pan. Bake until fragrant and browned around the edges about 15 minutes. Cool on wire rack. Bring 4-5 quarts of water to simmer in stockpot. Whisk sugar, spices, and salt in small bowl; set aside. Line a baking sheet with a triple layer of paper towels, then spread pumpkin over towels in a roughly even 1/2-inch layer. Cover with another triple layer of paper towels, press firmly until saturated. Peel off top layer, fold dried pumpkin over itself to remove bottom layer, set pumpkin aside. In a standing mixer fitted with flat beater, or in a large bowl using a hand mixer, beat cream cheese at medium speed to break up and soften slightly, about 1 minute. Scrape beaters and sides of bowl with rubber spatula. Add about 1/3 of the sugar mixture and beat at medium-low until well combined, about 1 minute. Scrape bowl and add remaining sugar in two additions, scraping bowl after each. Add pumpkin, vanilla and lemon juice, beat at medium speed for about 45 seconds, scrape bowl. Add 3 eggs and beat at medium-low until incorporated, about 1 minute, scrape bowl. Add remaining 2 egs and beat at medium-low until incorporated, about 45 seconds, scrape bowl. Add heavy cream and beat at low speed until combined, about 45 seconds. Scrape bottom and sides of bowl, give it one last stir. Set springform pan with cooled crust on an 18-inch-square double layer of heavy-duty foil and wrap bottom and sides. Set wrapped pan in roasting pan. Pour filling into springform pan and smooth surface, set roasting pan in oven and pour enough simmering water to come about halfway up the side of the springform. Bake until center of cake is slightly wobbly when pan is shaken, and center of cake registers 150 on an instant-read thermometer, about 1 1/2 hours – but check it after 1 1/4 hours just in case. Set roasting pan on wire rack and use paring knife to loosen cake from sides of pan. Cool until water is just warm, about 45 minutes. Remove springform from water bath, discard foil, and set on wire rack. Continue to cool until barely warm, about 3 hours. Cover with plastic wrap and refrigerate until chilled, at least 4 hours, or up to 3 days. Add sour cream to marshmallow mixture, fold gently to blend (whisk gently if needed to get rid of any lumps). 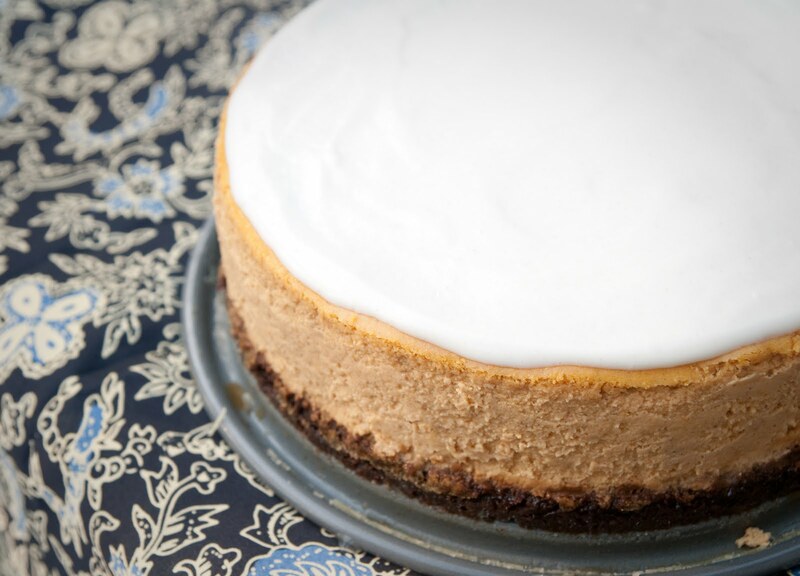 Pour over cheesecake and spread evenly, leaving a thin border uncovered at the edge. Chill to set, at least 1 hour. Bjorn and I carved pumpkins this year for Halloween but no one came to my house because no one could see them. Then I roasted the seeds with salt and olive oil and ate them like a gerbil for about a week. Delicious!